The "vampire" threat here has little in common with your garden-variety Dracula, the fanged menace of Transylvania; these quiet apparitions are in some ways more macabre. 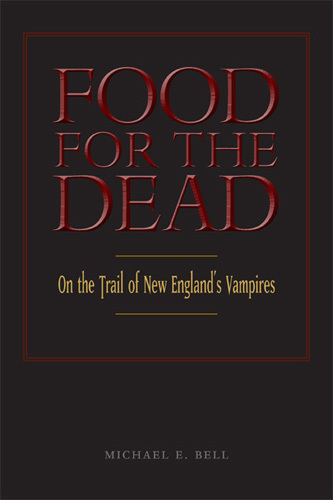 In historical New England, consumption claimed thousands of lives. When several family members fell in quick succession, some suspected interference from the grave the "dead" extending their own lives by claiming those of others. Corpses were disinterred. Hearts were extracted and, if found to contain "living," or fresh, blood, subjected to an elaborate cremation and exorcism. Bell, a folklorist, pursues this grisly tradition one that still survives in legend throughout the Eastern seaboard and records his observations here. Despite tantalizing chapter headings ("I am Waiting and Watching for You," "Ghoulish, Wolfish Shapes"), Bell strives laudably for responsible scholarship, and the book is as much a critique of myth transmission as it is a tale of one man's vampire hunt. He goes to great lengths to forestall and undo exaggerations of his findings, advocating a very qualified and moderate use of the word "vampire" and transcribing oral interviews so painstakingly they can be difficult to read. But Bell himself is a talented stylist, and academics working in folklore and myth will find his study a refreshing departure from the dry fieldwork ordinarily on offer.